Our mission at Newham Sixth Form College is ‘to create a successful learning community’. Each of the three ideas; success, learning and community are important to us and we make sure we define what each one means for all our new students at the start of every academic year. We know that our students come to us with some prior experience of educational success and that they have already demonstrated some effective learning. We believe that one of our educational tasks is to prepare them to be even more effective learners and this will serve them throughout life. One of our aims is that every student should leave us as a more skilled learner than when they joined us. So we have a Skilled Learner framework: DOES. The idea is to remind everyone of some key attributes which we think everyone should be developing whatever they are studying. These are common to effective learners and can be developed further by everyone. Whatever your starting point, whatever your course, you should be working on all of these in a way which is natural and embedded in your acquisition of subject specific knowledge, skills and understanding. We’ve chosen a simple and memorable framework which allows for a high level of awareness and regular use across the college. The DOES framework describes the skilled learner under 4 headings: Determined, Organised, Enquiring and Social. The starting point is intrinsic motivation or aspiration: “I want to do well… I love Maths… I want to know more about History… I want to progress to university…” This is combined with a recognition that learning is hard work and effort will be needed. This builds on previous experience that effort brings rewards but the commitment and stamina will be stretched further than ever before. Advocates of ‘grit’ and ‘resilience’ will recognise the value of this. Above all, we want students to ‘own’ both their ambition and their learning so that neither crumbles after they leave us. All the resources we need to learn are finite, so we need to find ways to make the most of them. We are not born organised but by 16 we have learnt that planning can help things to happen the way you want them to. Turning up to classes on time, well equipped and well prepared, being up to date and managing time well are all a good start. Being organised and structured in our thinking, even if our minds wander off all over the place, can also help us make the most of our ideas and the connections we are making between them. We are questioning animals; the greatest living learners on the planet. From day 1 we are testing our world and asking question upon question. We need to hold on to the curiosity that leads young children to ask those irritating “but why? but how?” questions. Doubting, critiquing, digging further and deeper into things…these are all vital to learning. This means being prepared to take a different perspective, see things from a different angle, to challenge and be challenged. Don’t be satisfied with knowing only the minimum required. To be confident about the subject content you need in order to do well you really need to have gone well beyond it. Learning is highly social. We are always standing on the shoulders of others and building on their experience and understanding. Even when we are studying alone at the computer or with a book, this is an interaction with others. Anything we do with our learning will be aiming ultimately to have some impact on others. We need to test our ideas out on others and get feedback from them. We need to learn from and with others; students and teachers. This means being good at listening and learning from what others say as well as being good at communicating our own ideas to others. Your learning may be personal to you but bouncing ideas around with others in a group can enhance it. This framework is not an attempt to describe how learning takes place, of the ‘action / reflection / action’ type, or to prescribe a particular pedagogical approach or set the balance between content and skills, such as ‘grammar / rhetoric / dialectic’. The descriptors have no levels or progressive steps, simply a recognition that all of us can develop further in each of the 4 dimensions. It doesn’t refer to the development of literacy or numeracy which we regard as central to our work; this is described elsewhere. We know that many other factors come into play to help learning happen. 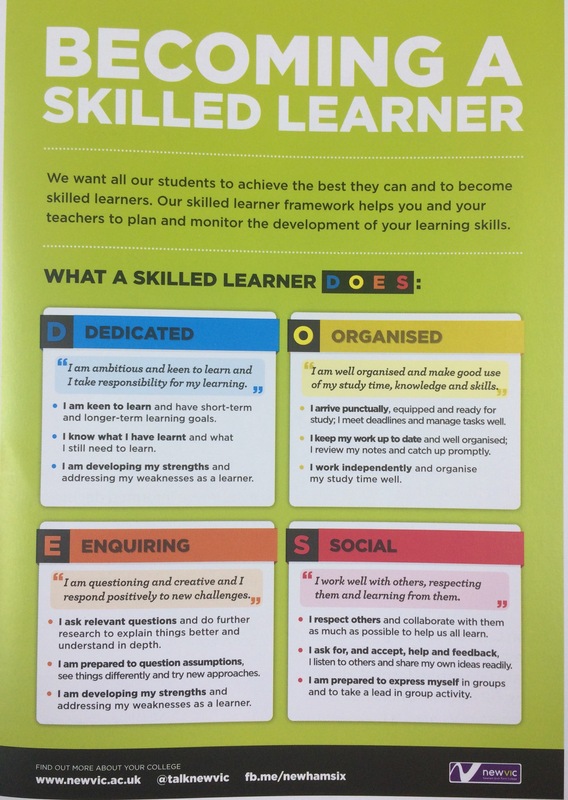 This is simply one handy way to help us remind all our learners about some of the ingredients of that somewhat mysterious process called learning and to make sure we can consciously work with them on those areas throughout their time at college. The DOES posters can be found in every classroom and the framework has become part of our language in talking about learning – one shared tool among many. We make no claim of originality or impact for the DOES framework but please feel free to use the whole thing or borrow selectively from it if you feel it can be of some use in helping students become skilled learners. This entry was posted in Education, Students, Teaching and learning and tagged Critical thinking, Education, learning, Newham Sixth Form College, NewVIc, skills. Bookmark the permalink.